Anti-Thief that detects your cellphones is lost or stolen even if you didn't send a message to it. Just keep Anti-Thief status on and if you want to turn your cellphones off just turn Anti-Thief off first with your Turnoff code. If the mobilephone is turned off in a wrong way (not turning Anti-Thief off first), next time the phone is powered on Anti-Thief will start automatically and will attack the thief with a permanent text on the screen saying that this mobilephones is lost or stolen with any other text you provide (recommended to be information to contact you) and a very loud long siren. 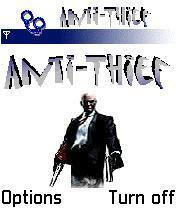 The program will also send messages to a list of recipients you created for Anti-Thief. You can also send a message to Anti-Thief containing predefined words (activation text) to put it in attack state. Even if Anti-Thief status is off and a message arrived containing activation text, Anti-Thief will activate itself and attack the thief.